Making sushi at home will become easier with practice. But it is always good to keep a few things in mind as you are making your first attempts and even throughout your career as a sushi shokunin. Herein I have compiled a list of tips that even I have to remind myself of sometimes when I get the urge to make sushi at home. Making sushi at home is not a breeze, but the fruits of your efforts will be worth it. Remember to buy sushi grade fish or other seafood if you intend to eat anything raw. Otherwise you risk illness from parasites and bacterial contamination. And handle your food carefully, being particularly careful to keep your raw ingredients well chilled when not in use. Avoid cross contamination! Never let your raw ingredients touch anything other than your utensils and the food you intend to eat it with (N.B. Catalina Offshore Products is where I get most of my fish). Some of the harder to find garnishes can be grown in your backyard. Daikon and Shiso (perilla) are available online and can be planted in your garden for use all summer. Daikon can also be stored for the winter in a root cellar or similar conditions. Just beware, plant shiso in an isolated container (like a planter) because it will spread fast and take over any area in which it grows. I learned this the hard way. 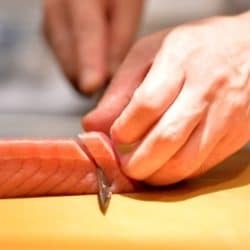 Keep your knife blade barely wet when cutting your maki (cut roll). This will facilitate a clean cut so as to not crush the roll. A good way to do this is to dip the knife tip in a bowl of water and turn it so that the tip points up. Tap the handle on the table to let gravity do the work of sending the water down the cutting edge. Making sushi and especially maki is not easy. Think about what you are doing and keep practicing. Your first few attempts will almost certainly not turn out they way you want. Try not to get discouraged and it will become easier over time. If it has been a while since you made sushi, you may be rusty as well so keep that in mind and don’t expect your first attempt to turn out well. If you are getting frustrated with making maki, take a breather and make some temaki (hand rolls). They are much easier and just as satisfying. They look nice too. No one will be able to see the cat footprints in the rice after your maki is rolled up, so keep going and pretend it never happened. You’re home, right?